Mustard plants can be found all over the Mount of Olives. They produce little pods and the pods have hundreds of little seeds about the size of ground pepper. In fact, if the wind blows too hard or you sneeze, they will disappear right before your eyes. 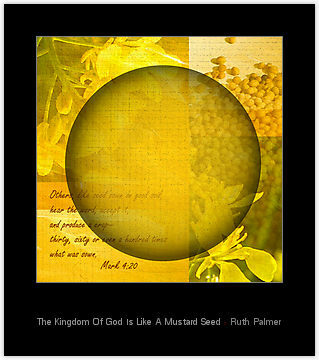 This is why Jesus chose the mustard seed for His inspiration. It was the smallest seed in the experience of those listening. This little seed doesn’t stay small. It grows to be a tree 8-10 feet tall, providing cover and nesting for birds. Remember parables are earthly stories with heavenly meanings. Jesus is saying words and revelations that come from the Lord are just as small as a mustard seed. This is the Kingdom way…. insignificant, small beginnings can have major impacts. What starts out small but is planted in good soil can grow to become something huge that ministers to all around. Christianity today is far too impressed with “bigness“. Unless we see enormous structures and multitudes of people, we simply do not believe God is in it. According to Jesus, nothing could be further from the truth. In fact, the polar opposite may be true. Yet many only study large churches to learn the secrets to their success. We rarely study small churches because we do not believe God is present in such small things. Here is the truth…If God speaks a word, it is because He desires to plant and invest in our lives. His word should become the most important thing going on in our lives. Why? Because even though God’s word may start off small and insignificant, it will grow, making some kind of Kingdom impact. So…what has God been speaking into your life lately? God still speaks in a “still small voice.” Our responsibility is to be good soil for His word to grow. Don’t despise these types of small beginnings. Instead, treasure every word of God.